With the preppies beaten into submission, Jimmy's turning his attention to the rich kids' sworn enemies: the greasers. The greasers' leader, Johnny Vincent, wants Jimmy's help with something, but since he's not willing to come see our hero in person, Jimmy isn't the least bit interested. This "mission" appears on the second day of the winter term, regardless of what other missions you've already completed. It's not really a mission in the usual sense. Ms. Danvers hands Jimmy a Christmas present sent to the school by his mother — a Happy Reindeer sweater. Jimmy automatically puts it on, but you can go to the dorm and change into something else if you really don't like it (the students will laugh at you when you wear it).So shut the students up by wacking them! Edna has big plans for a date with Dr. Watts, the Chemistry teacher. He doesn't know it's a date though, so she wants your help getting some things together to prepare for the evening's romance: perfume, chocolates and some sedatives. The perfume belongs to Ms. Philips and is in the staff room, but the door's being blocked by two teachers. You need to get them out of the way, so pull the fire alarm — run to the nearest bin or locker and hide, so long as they can't see you duck in. When the coast's clear, head back to the staff room and go in — the perfume is in Ms Philips' bag on the table at the far end of the room. You may already have the chocolates, but if not you can buy them from either of the Yum Yum Market stores. The best one is in Bullworth Town, because it's right beside the Happy Drug pharmacy where you'll be picking up the sedatives. Also, you can purchase some chocolates from Fatty, who is standing with some other Nerds in Bullworth Town. The pills are in the bin left to the hobo behind the drug store; use to kick them all, and you'll find some prescription medication. This counts as vandalism however, so watch out for the police. One of the radio transistors is also back in this alley, if you want to pick it up while you're there. When you've gotten all three items, bring them back to Edna in the cafeteria to complete the mission. An old homeless man, possibly Santa Claus, is fed up with the townies pestering him, and he wants Jimmy's help teaching them a lesson. The structure of this mission is very similar to The Candidate mission from Chapter 1. Climb the ladder to the left of the homeless Santa, then run into the glowing circle by the pile of snow. The game will switch automatically into the aiming view; move the reticle with and fire with . Hitting adults by mistake will cause your wanted level to rise, but the cops can't get up the ladder and it'll automatically go away once the mission's over, so it's nothing to worry about. Hit ten townies to get $10, and unlock the Reindeer Antlers outfit in Jimmy's wardrobe. An imposter is muscling in on Santa's business, and Santa wants him gone. You'll find "Santa"'s Grotto in the square just in front of City Hall — wreck it. The elves shouldn't bother you too much, and so long as you don't leave the grotto's main area, the cops can't bust you. Completing the mission unlocks the Elf Costume in Jimmy's wardrobe. Ms. Peters, the music teacher, has a problem: her main percussionist is out sick with appendicitis. She needs someone to fill in and save Christmas – and luckily for her, Jimmy has just walked by. The mission structure is basically an extended version of music class(However,leave the game with a "passed score" will still fail the mission) – you've got to play along with a medley of Christmas songs, hitting the and using the and when prompted. Completing the mission gets you $20, and unlocks the Nutcracker outfit in Jimmy's wardrobe. Starts: Bullworth Town, in the alley behind the Happy Mullet Barbers. Now that his business rival is out of the way, Santa wants to set up his own grotto — but he'll need decorations. 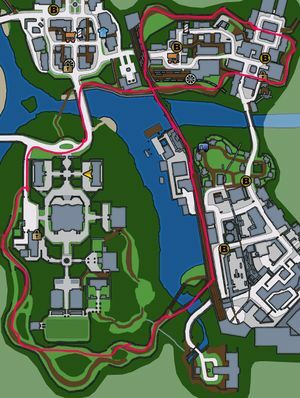 The first part of the mission requires you to run around Bullworth Town and pick up five ornaments from various trashcans — you'll be pursued by elves and a dog, but you can easily outrun them so long as you don't get caught in a dead end. Bring the trash back to Santa to start part two of the mission. Photograph five children on Santa's knee when they're behaving and smiling to complete the task. You'll get $50 for your troubles. The nerds have a challenge for you — if you win, you'll get the use of their comic store basement clubhouse as a save point and the Bottle Rocket Launcher. All you have to do is beat Fatty's high score of 1,010 points on the ConSumo arcade machine. Win it and you're likely to never play that damn game again. Key to win this stupid game: You can die by getting bounced out of the screen by sumo wrestlers, by running into a blowfish or by losing too much weight. You win by running around and grabbing the "good" food, consisting of bowls of rice, apples and fish. Hitting "bad" food (bad rice, fishbones or apple cores) makes you lose weight. Greaser leader Johnny Vincent has issues — he thinks everyone's laughing behind his back, and accuses Jimmy of getting it on with Lola behind his back. It turns out she's with Gord, and Johnny wants your help to get pictures of them together. Be very careful right at the start — if you go backwards, and leave Bullworth Town, you'll fail the mission. Likewise, if Gord and Lola spot you it's mission failure, so keep out of their field of vision (shown on your radar). They're hanging out near the main crossroads in Bullworth Town. You're looking for three photos: kissing, holding hands and exchanging gifts. There's no time limit on the mission, so take it easy — keeping out of sight is more important than speed. If you're getting too close, they will stop and turn towards you and make comments about a stalker, so if this happens, just back away from them. One trick to knowing when to snap the photo is to listen to their dialogue; it usually gives away what they're going to do next. The easiest way to get all three is to go into camera mode, zoom in and then stay in that mode the entire time. This way you'll be sure to always have the camera on the couple when needed. You can take the picture as soon as the picture border turns green. Once you've got all three photos, take them back to Johnny at the entrance to New Coventry for your reward. The time has come for Edna's date with Dr. Watts, and you're running backup while she waits for the sedatives in his coffee to kick in. This mission is very similar to The Candidate; you'll be staying out of sight and keeping unwanted students away from Edna and Dr. Watts during their extra-curricular meeting. First of all, climb the tree by the Aquaberry store. Walk over to the yellow circle and press to grab hold of the vines, and climb with . When you're hanging from the branch, press to pull yourself up — you should see Dr. Watt arrive. Take out the slingshot, and use to bring up a reticle, or enter first-person if you prefer. You've got to hit the students as quickly as possible; if they hang about too long, the date will be interrupted and you'll fail the mission. Once the sedatives have kicked in, Edna will drag the barely-conscious Dr. Watts off, and you'll have completed the mission. Johnny wants to know what Lola sees in Gord, and is determined to get his own back on the rich kid. He asks Jimmy to get Gord onto the Greasers' turf — get his attention, and lead him back to the bike park in New Coventry. It's strongly advised that you have a bike for this mission — either bring one with you, or find one to steal before you get Gord's attention. Find Gord in Bullworth Vale — he's marked on your map as — and provoke him. A well-placed egg or stinkbomb will to the trick, or just punch him. If you knock him off his bike, and get too far ahead he'll lose you and give up, so make sure you wait around for him in that case. Lead him to the bike park in New Coventry — after you come under the bridge take the first right and duck into the railway yard on the right. The entrance to the park is through the red door on your left as you come through the gate — cycle up and it'll open to let you into the rink. Once inside, help Johnny and his boys take out the preppies. Your slingshot is the best weapon here — it's accurate and fast — but watch out for the preppies' firecrackers. Completing the mission unlocks the bike park permanently. Mr. Galloway's drinking again, fed up with Hattrick's constant badgering and badmouthing. Jimmy suggests that some payback is in order, to show Hattrick that he's messing with the wrong guy. Get to the carpark — you've got to follow Hattrick home as he's leaving Bullworth Academy for the day. Get behind his car on your skateboard and press to "skitch" a ride. Hattrick's house is in Old Bullworth Vale, and Jimmy will automatically let go when you arrive. You've got to get onto Hattrick's property before the gates close, or you'll be locked out and will fail the mission. Once inside the garden, you've got to destroy as much stuff as you can, as quickly as you can. After a couple of noises, Hattrick will call the police, which will make things more difficult. Windows, both on the house and the greenhouse at the back, will fill up the damage bar quicker, so focus on using your slingshot to get them as quickly as possible — there's no need to build up shot power. When the cops appear, keep a close eye on your radar and stay out of their field of vision as much as possible. If you need to, you can use the large red planters as hiding places until the coast is clear. Once you've done enough damage, you've got to escape past the cops. If you do get caught, you should be able to use shake to escape at least once or twice, and you'll pass the mission when you're a little bit outside Hattrick's property. Johnny Vincent has gotten some crazy ideas in his head about Lola and Algie (yes, Algie! ), and the greasers are on the warpath. Earnest's concerned for his friend's safety, and asks Jimmy to find Algie and get him back to the school as quick as you can. Cornelius knows where Algie is, so you've got to track him down first. He's beside the boys' dorm, being set upon by a group of greasers and Gary. Gary and Johnny run off before Jimmy can get there, but you can still help Cornelius out. He told Gary that Algie was at the pizza parlor in town, but if you save Cornelius he'll tell you that Algie's really in New Coventry. Algie's with Lola in an alleyway near the entrance to Blue Skies, at the east end of New Coventry. When you find them, you'll see Lola playing the nerd off against Chad. Jimmy gets Lola to leave, and then takes charge of getting the other two out of the greasers' territory. You'll have to keep Johnny's friends off your tail while you escape though — Chad pedals, while Jimmy sits on the back of the bike with a slingshot. You've got a first-person view similar to The Candidate, through which you've got to take out the greasers as they appear. Keep an eye on your radar for which alley they're about to pop out of. Keep pressed so you can get off a charged shot quicker, as they do more damage. Chad takes the scenic route back to Bullworth, but once you're back just lead Algie to the other nerds waiting between the dorms to complete the mission. The preppies are getting frustrated with the greasers, but even pointing out Gord's and Chad's indiscretions with Lola don't give Jimmy enough to calm them down. They manage to talk Jimmy into sending the greasers a message by spraypainting offensive messages onto the walls in the greasers' territory. Head into New Coventry — just as you approach the entrance to the area, you should see a glowing yellow circle on the left under the railway bridge. Walk over to the and press to take out your spraypaint. A path will appear in the lower left corner of the screen. When appears, press and hold the button — it should change to a . Move the icon along the path, stopping to press and hold again when prompted. Get to the end of the path, and you'll have completed your first tag. Unfortunately, the preppies didn't give you much paint, so you'll have to buy some more. Head to the Yum Yum Market just inside New Coventry to get some more. Newly equipped, you've got to leave five tags around the area. Not all of them are at street level, so keep an eye out for ladders onto the roofs of buildings — you get a bigger payoff for spraying high-up tags. With all five tags complete, you'll unlock the ability to tag any area marked with a . A student's stolen some comics from the store, and the clerk's too slow and asthmatic to catch up. He promises Jimmy some cash and a couple of comics if he catches the perp and brings the merchandise back. This mission is much easier if you've got firecrackers, but any projectile weapon will be useful. Otherwise, you've got to draw alongside the thief and punch him with or . You've got to catch the thief before he makes it back to Bullworth Academy; his route takes him around Bullworth Town and up past the dam, into Old Bullworth Vale. When he falls off his bike, grab the comics the perp drops and bring them back to the comic store for your reward. The greasers have a hangout in New Coventry that Jimmy wants; unfortunately, they're not too keen to hand it over. Beat up the three greasers in the room, and two more will come in through the back doors. Defeat them as well, and you'll have yourself a new save location to use. The room has a save point and bed, as well as a Monkey Fling arcade game. Map of Lola's Race route that the single lap takes. Lola and Johnny are having another argument when Jimmy shows up. Lola manages to talk the boys into having a race after Johnny insists he's the faster of the pair. Like all the races, you'll fail the mission if you don't come in first, so you might want to grab a faster bike before starting this mission. Your opponents won't play fair either — they'll try to knock you off your bike, but will stop short of using weapons. If you've got firecrackers, they can be helpful towards the end, if it's a close race. The race path leads around the streets of New Coventry and up onto the railway bridge over the Blue Skies estate. Along the train tracks, watch out for the train carriages. You can knock other racers into the path of oncoming trains to give yourself an advantage. At the end of the tracks, the route peels off to the right and heads across a narrow bridge onto the back paths around Bullworth Academy. Don't bunnyhop off jumps, it slows you down. There are also a couple of shortcuts that the other racers will take advantage of, so if you spot them first they will help — although they're not essential. Along here, some of Johnny's lackeys will start pushing the trees over to block your path — use to jump over the trunks and you'll not be held up too much. If you're on one of the faster bikes that doesn't jump as well, get as far to the right as you can where the tops of the trees don't present as large an obstacle. Eventually you'll emerge onto the carpark exit road at Bullworth Academy, heading out to the main road. At the end take a left across the main bridge and take a right as soon as you're on the other side of the river, along the dirt path. There's more falling trees here, but again just hop over them to keep your speed up. There's a fairly sharp left turn at the end of the path, and a sharp right shortly after — if you hit the walls around here at any kind of speed you're in danger of coming off, so be careful. Follow the narrow alley around the corner to the left, and you'll see the finish line more or less exactly where you started. If you come first, it's mission complete — Lola now likes you. The greasers are starting to ignore Lola because Johnny's not in the mood to deal with her, and won't even let her into the abandoned tenements they use as a HQ to get her things back. Jimmy offers to help get her things back. The tenements are at the far end of New Coventry, on the north side. You've got to enter through a window in the alleyway to the left of the building, but be careful not to get cornered in the tight space by a group of townies before you manage to open the window. Once inside, take out your slingshot — it's going to be very useful in here. You should also keep an eye out for crates; smashing them is a handy way to find useful items like soda cans and ammo. On the wall to your right, you should notice there's a part where the plaster's fallen away, and you can see one of Lola's items through the gaps. You need something to take the wall down though, so you'll need to leave it for now. Head over to the door, and take out the greaser in the doorway directly opposite the corridor. Head into that room, and take out the other greaser in the corner to your right. Lola's address book is on the table in the corner farthest from the door. Back in the corridor, head up the stairs at the far end. You can take out the greasers here with your slingshot without needing to get too close. When they're dealt with, don't just run for the stairs at the far end — part of the floor's given way, and you'll fall back to the ground floor if you're not careful. Instead, head into the room on your left as you come up the stairs, and you'll see one of the greasers run outside. Follow him out, and use your slingshot to take him out, as well as the other two greasers who appear shortly after. Follow the gantry, and go back inside the building at the far end. In the room directly opposite this one, Lola's lipstick is sitting near the sink. When you've gotten it, move up to the top floor. There are two rooms to the left, but there's nothing noteworthy in them; if you're running very low on health it's worth checking for crates. Take the door on your right and then go left to find Lola's laundry. As soon as you pick it up Norton, a big greaser with a huge sledgehammer, shows up to get revenge on you for beating up his friends. Be very careful in this fight — if Norton gets too close, he'll do some major damage with that hammer. Your best bet is to keep a lock on him with and circle around using your slingshot as much as possible — let the shot charge as much as you can. It's also worthwhile to break off every so often and run as far as you can to put some distance between you and Norton. If you've got bottle rockets this fight is extremely easy and quick. All it takes is eight shots from the bottle rockets to take him down. There's only one reload in that time if you make all your shots, so just run around to avoid Norton during that time. When Norton's done, pick up his hammer and smash down the wall back into the room where you picked up Lola's laundry with with by shaking . You're now able to break down the walls to get the remaining two items, so head downstairs and go into the room on your right. Break through the wall and pick up Lola's keys, then smash through the other wall. Take a left and head back to the ground floor. From the bottom of the stairs, go into the left and break down the wall to get Lola's perfume, the last item on the list, and break through the other side to get back into the room with the window you used to enter the building. Take the items back to Lola, under the bridge at the New Coventry entrance to complete the mission. Lola wants Jimmy to fight for her, but he's more interested in the prospects for power that'll result from the imminent clash between the greasers and preppies. The leaders of the two cliques are determined to fight for Lola's heart, and it gives Jimmy an opportunity to bring Johnny Vincent under his control at last. To find Johnny, you've got to get a hold of his second-in-command, Peanut. He's marked on your radar with — when you find him, follow Peanut to an alleyway near the tenements. Take out Peanut and his two lackeys, and Johnny himself will show up, but just as he lands the first blows the cops show up to put an end to the full-scale riot that's broken out in New Coventry. Jimmy chases after Johnny, but you'll find a police car on your tail as you're chased along the back alleys on a bike. You've got to outrun the cops until you track down Johnny Vincent. The car's pretty slow though, so just keep hammering and you shouldn't have too much trouble. Keep an eye out for the greasers though; they're also running from the police and if you hit one you'll slow down a lot. When you reach the end of the dirt track alley, you'll be in a junkyard. Jimmy's off his bike, and several greasers have lined the top of the junk. Petey Kowalski has also arrived, and is going to help you out as best he can. Johnny's still on his bike, and will circle around the arena while the greasers around the top will throw eggs, stinkbombs and firecrackers at you. The most important thing to do at the start of the fight is to take out all the greaser lackeys with your slingshot, for two reasons. Firstly, they'll pelt you and make it harder to concentrate on Johnny; secondly, and more importantly, when they're out of the way Pete will be able to get to the crane and activate the magnet. When Pete gets to the crane, stand under and just behind the magnet hanging over the arena. Johnny will come for you, but his bike (and the metal pipe he's holding) will get stuck on the magnet. This greatly evens the playing field, and from here out it's the same as any other fight. This is another fight easily handled by using the cheap Leg Sweep tactic. Keep using , + and Johnny will never land a punch on you. With the fight over, Johnny gives in — you can have Lola. Jimmy's not sure what he's talking about, and tells Johnny that he doesn't care about Lola, but the greasers work for him now. Johnny agrees, and Chapter 3 ends. This page was last edited on 9 November 2016, at 23:09.